This procedure provides instructions for reviewing and approving payable time. After an employee submits time through the timesheet, web clock, or time clock, the time is analyzed through the Time Administration process. The reported time is changed to payable time. The time must be approved before it is passed to payroll. 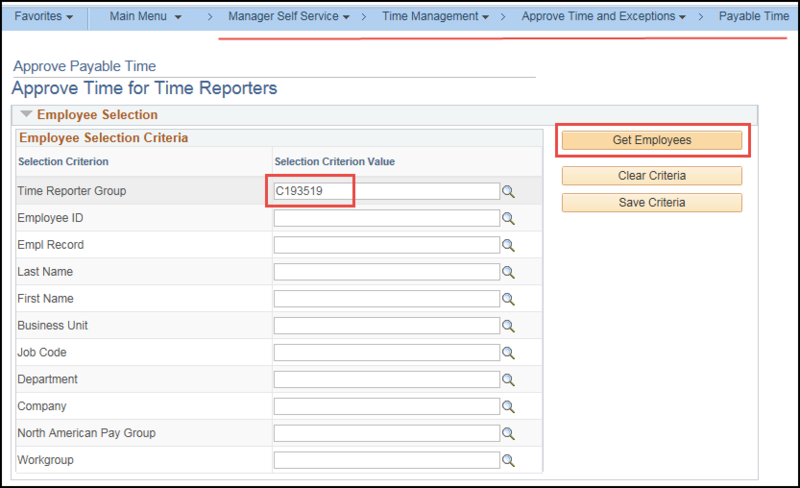 Payroll coordinators will navigate to Manager Self Service > Time Management > Approve Time and Exceptions > Payable Time. Enter Group ID, Empl ID, employee Last Name/First Name, Business Unit, Job Code, Department, Workgroup, or any combination of the selection criteria. Please see user procedure TL - Employee Search Options for more information regarding group look ups. As a Best Practice, use only the Group ID when selecting employees with payable time to be approved. Using numerous selection criteria can result in some employees with payable time to approve being inadvertently filtered out of the selection results. Enter the Start and End Dates for the period you wish to review. Reminder---you should also check prior periods for any time that you may have adjusted from a previous pay period. You may remove either the start date or both the start and end dates to view payable time for all periods. Depending on your selection criteria, one employee or a list of employees will appear below. In the example below, a search for Group ID C193519 employees with payable time that needs approval in the period 09/04/2016-09/17/2016 results in three employees. Note: Only employees with payable time to approve will appear in the search results, if no employees have payable time to approve, then no employees will be shown in the search results. Select an employee by clicking on the employee's Last Name hyperlink. You are then taken to the Approve Payable Time details page. If there is a question about the time, click the Adjust Reported Time hyperlink. The employee's timesheet is opened in a new window. Make adjustments or corrections to the timesheet. Please see TL - Timesheet Adjustments for more information on adjusting timesheets. After changes are made in the timesheet, you may return to the payable time page by closing the timesheet tab. The changes will not be available to approve until the Time Administration processes again (4a, 9a, 11a, 1p, 3p & 8p). You may wait until the next Time Administration run to approve the time or continue with the approval of the time that is correct. To exit the employee and continue with the next employee if a group search was done, select the Previous or Next Employee hyperlink or the Return to Approval Summary hyperlink. If you want to wait to approve the payable time, do nothing and go to the next employee. Press Yes to Approve (or press No to not save the approval). If you click Yes, you receive a Save Confirmation message that The Save was successful. Click OK to confirm the Save message. You are returned to the Approve Payable Time details page. If there is no more payable time to approve, you are finished. If there is other payable time to approve, continue with the next employee if a group search was done by selecting the Next Employee or Previous Employee hyperlink or the Return to Approval Summary hyperlink. This is used when the payable time should not be approved, such as when the employee accidentally submitted their time on the wrong day. The expectation is that no payable time on that day should be processed for the employee to be approved. The Deny option does not need to be used when the employee's timesheet is updated by the manager. Once the time is removed from the employee's timesheet, the next time that the Time Administration job runs, the payable time requiring approval will no longer appear on the Approve Payable Time page. If time has been approved and then a change is made to the employee's time, the updated time will create adjustments in payable time after Time Administration runs which must be approved. The adjusted time may show as positive and/or negative numbers, depending on the adjustment that was made. In the examples below, two hours per day are approved. Then time on one day is changed to four hours, and time on another day is changed to one hour. The changed times appear in Approve Payable Time details for the amounts of the change and must be approved. After time changes or corrections have been made to a previous pay period and the change has been processed through Time Admin, it is necessary to approve the time. To approve the time for a previous period, on the Approve Payable Time page change the date range to the period when the time correction was made and follow the steps listed above.